WHEN an email landed in my inbox asking if I was interested in finding out more about a book called My French Life, I thought with a title like that how could I resist? So I quickly arranged an interview with the book's author Vicki Archer, and asked for a copy so that I could offer it up as a prize for readers of the site. The Q&A style interview is below and you will find details of how to enter the competition to win a copy of the book at the end of the piece, but first a little about Vicki Archer and her book. Vicki, who is originally from Australia, discovered a farmhouse in Provence whilst exploring the region with her family and despite requiring extensive work, today it has become the centre of a thriving olive farm. And although Vicki and her family are based in London, they still spend as much time as they can at the house, especially at this time of the year with the olive harvest imminent, so my first question was to ask her how a love of France had come about? I'd been travelling to France for about 15 years always loved it and found this property which I loved as well which drove the decision forward to make the most of our time there. It wasn't an intended thing, but there was certainly a love affair with France going on in my mind and this property just tipped me over the edge I think. 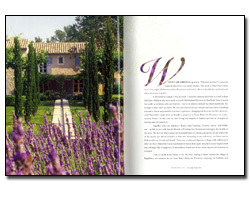 I know the house is in Provence, but whereabouts and did you know the area in advance? Our home is just outside the village of Saint-Rémy-de-Provence and I had done a lot of exploring in that area and had worked out that if I was to ever have a home in France, that would be the area I chose. So what sort of condition was the house in when you bought it? Did it need some work? Oh yes, it was completely unliveable. It had been an old farmhouse and I suppose the original part had been built four or five hundred years ago and like all property of that age over time different generations built on a little bit of this and a little bit of that. But by the time we saw it really it was just a pile of rubble and we had to start again to make it into a home. It had been a fruit farm, although when we saw it it was abandoned, but I had an amazing rapport with the estate agent who was selling the house, and she has since become a great friend, and I knew that even before seeing the place I had fallen in love with it and it was a life changing decision that you either don't believe or think happens to somebody else. Did I want a fruit orchard? At the time no, I am a city girl who had fallen in love with the country way of life, but we retained some of the orchards and have gone on to plant an olive grove, which is the business of the farm, and transformed the place really. Were the local people keen to help out as well? I had a completely local team help with the restoration of the house and the people who work on the farm now are local and I have found them to be delightful, but also passionate about the farm. The relationship I had with the craftsmen, and I call them craftsmen because they truly are, went really well as they do things and use techniques that are passed from father to son and use time honoured methods, relying on the processes from the past meaning there's a real pride in their work, which was a wonderful experience for me. How involved with the local community are you? I'm very hands on, so I'll be out picking the olives, it's a long day but it is a fantastic thing to do, especially if the weather is dry with a clear blue sky, and although cold, there is a great deal of camaraderie and because the fruit is full of oil it is not too hard on the hands. It is a wonderfully relaxing thing to do and so you forget all the day-to-day things, all the things about city life, and just live in the moment and as the day draws to a close you think "how many kilos have we picked today?" and there is a great feeling amongst those involved. It's good wholesome work, and although you are tired at the end of the day, you have earned your glass of wine, meal and your sleep. I am great friends with the photographer Carla Coulson and we both moved from Australia at about the same time, she to Italy and I to France. We met up on a trip and got chatting having not seen each other for five years and she told me about what she was doing and I explained what I was doing and said "that sounds like a great story for a book" and so contacted Penguin and the rest is history. So what will readers discover in the book? I would describe it as a collection of personal anecdotes, but it really started off as a number of chapters and photographs that explained the things I love about being in France - really a grand love affair if you like. And I have used my background as a way to add a bit of personal detail to the facts and names and addresses that are in the book, which are for people who wish to travel there. But there are also collections of French book I like, as well as French films, it's a real mixture of things for the budding Francophile, or an existing one, whether you are a traveller or an armchair traveller. 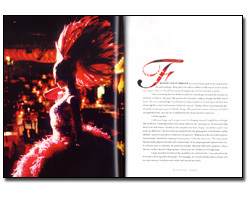 And the photographs in the book are truly beautiful, Carla has done an incredible job. What plans do you have for the house in the future? Well coming up is the olive harvest and it looks as though it will be quite a good crop, but my dream would be that the harvest gets better every year and that I continue to plant more olives and that proves successful. 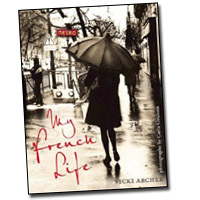 Learn more about My French Life by Vicki Archer on Amazon, and if you buy a copy then I receive a small commission which helps keep the wheels rolling on This French Life. I too have been travelling to France for the past 15 years. I dream constantly of buying a home and living in France permanently. What a great experience! I would love to know the ups and downs of finding a home, rebuilding a home, and maintaining that home. Since I am a big fan of this blog and have found the information very informative, I would love the chance to read this book! I too have a love affair with France. I have visited various places throughout Europe over the last 12 years and I still return to France. I vividly recall my first visit, stepping out of the metro to be presented with the most beautiful pink clouds...whenever I am there I feel as though I have come home. as American married to Brit we constantly talk about moving there and I have no doubt we will end up there. I am always interested in reading others experiences with moving countries and particularly as they relate to France. If I make 20 comments do I have 20 chances to win? I have a bit of a love affair with France going on... only thing is that I have never been there. I am French, and to this day I still have family in Normandy, La Rochelle and Rochefort. I have always wanted to visit France and I hope to one day made that dream come true. I'm lucky enough to live in France myself. I love the area around St Remy but am further north nearer Aix. Anyway, I'd like to have a chance to win that book! I have just returned from a 3 week mother /daughters (10 & 13)trip to Paris and Provence. It was a magical enchanting experience that covered everything from food to Velibs; gardens to horses riden thru vineyards. They learned what makes France so enchanting - it is all in the details...We would love to win your book! I am in love with rural France. I would love to retire there. Although I have been to Europe in the past I have never traveled in France or Italy. I was raised on a farm in Lancaster County, PA (USA) and could really get into the rural life that is so hard to find here. This book sounds fabulous. I have dreamed of living in France since I was a little girl. Even at 45 I still dream of living in France. Though I doubt that dream will ever come true this book will continue to keep my dream alive and give it some color. Thank you for a chance to win a copy. After living in Florence for some time, I didn't think any other city/country could compare. But from what friends have told me, Paris and other areas of France are equally wonderful. Perhaps Ms. Archer's book will make me run--as opposed to walking slowly--to buy that plane ticket to France. Sounds like a wonderful experience, and an interesting book. I have empathy with all this due to the fact that my wife and I have had a similar experience in the Roannaise region. We have planted our souls into this region of Franc during the last 10 years, or more, having renovated recently a large 'cuvage' (wine-making barn) with some French friends, using local artisans. We are now trying to tell people about this beautiful part of France via our own dedicated website. We have thought seriously about producing a book about our experiences - maybe one day! My wife and myself are fortunate to own a house in France and at present we can only visit for short holidays. We are approaching retirement and really look forward to spending months rather than weeks in our 'little corner of France' with our dogs. We both love reading books about France and this book sounds as though it will be an excellent read. My Wife & I were lucky enough to by a house in a tiny hamlet in the Charente, earlier this year. It was a dream come true for sure & although unable to move in just yet, the warmth shown to us by our neighbours and local people is really quite humbling. We're of an age where we remember politeness, good manners & being neighbourly, etc, etc in the UK but sadly, not any more but in France however, these principals still exist. The French know just how to live a good, quality way of life & we cannot wait to join them. I have lived in rural France for 16 years but am always interested in other people's versions of "life in France" so I'd love a copy of your book. I WENT TO PARIS, FRANCE FOR THE FIRST TIME IN JUNE, 2002. MY FIVE SENSES WERE "INTOXICATED" ALL THE TIME DURING MY STAY!!!!!!! I WENT BACK IN 2004, 2006, 2007 AND HOPEFULLY 2008. I TOOK A FRIEND OF MINE FOR 9 DAYS AND SHOWED HER THE CITY. I KNEW MY WAY AROUND AND I FELT GREAT! PARIS IS IN MY MIND EVERYDAY! I THANK GOD THERE IS PARIS, BECAUSE I KNOW MANY OF US ARE FULL OF ENERGY AND JOY JUST TO HAVE PARIS IN THEIR THOUGHTS!!!!! IF I GET STRESSED OUT DURING THE DAY, I MEDITATE ABOUT PARIS AND "INTOXICATE" MY FIVE SENSES AGAIN!!!!! My wife and I now both retired, bought a 200 year old, wreck of a cottage, in a small (250 inhabitants )wine making village, in the Lot region 1n 1989. Until retirement we could only visit for a few weeks each year, but since 2000, we spend about 5 months altogether per year in the house. We are the only English in the village, and have be made very welcome by all, and get many invites to all our neighbours for supper etc. They say we are "there" English and we have been adopted into the village.The countryside is beautiful and everyone describes it as " tranquille ", which I think really sums it up perfectly. We have the advantage of "two lives " since we moved from London, into the Bedford countryside in 2000, and our now beautifully restored cottage in "our" village in France.We count ourselves as very lucky. Anybody who wants to renovate an old house in France should know that to do any job, you have to do 3 other jobs first and at least one of those is impossible! When I was offered THE job and the career ladder loomed large in front of me I thought nothing of moving to France. It was just another country. Now, 9 years on, having done the mid-life crisis and quit the daily grind for a more relaxed way of life, my love affair crept up on me and when faced with the choice of staying or going; staying wins hands down every time. My glasses are not rose coloured by any means, as France, like any, has its flaws and peculiarities, but like any good lover it has a charisma all of its own and new delights are to be found every day. But please, please shout the praise quietly lest that which was the attraction is destroyed! Just reading the beautiful words about France relaxes me. I have never been to France, but am planning a trip for the summer of '08 with my husband. I am listening to tapes and reading in order to learn as many French words as I can before our trip! I've never been to France, but until I can make the trip on my own, thank you to websites such as This French Life and books such as Vicki Archer's which allow me to enjoy France vicariously! Now, if I could only master the language . . .
My daughter and I arrived in Paris, May 1,07 and was greeted by The Red Cross with a small bunch of Lilly of the Valley flowers. Every sign was in french in the train station. We walked many street in Paris, and came across fruit, floral and meat markets, one floral shop that cought my eye with orchids, geraniums and roses I went inside and even more beauty with a Aviary with exotic birds, the beauty of this floral shop inspired my to some day open my own shop. I feel as if I live & breath French. I have always had an illusion of what it would be like to go to Paris and found my way there on my 50th birthday. I fell in Love with France & had tears in my eyes when I was leaving to come back home. We went to our favorite restaurant that we wandered into the first day there and the waiter said why dont we just stay? It was so tempting but reluctantly we left for home and we wait for our return one lovely day. I would find it very difficult to put my roots down in any particular region of France. Like you all, I adore France - all of France. With different cultures within the different culture, countryside and scenery that varies with every department and a chance to make new friends with every visit. I find at the moment that 'holidaying' gives me a chance to see the France that being tied down to one region would inhibit. ah, quelle belle histoire. on peut toujours rever. I too am having a love affair with France, my dear friend and her husband bought a home in France just outside of Gavray Normandy. My family and I have spend a few vacations there and it was like going home every time we went. This year they sold the house, now I guess it is my turn to buy one. I know one day we will, in fact I have stopped buying things for my Canadian home, one day I am going to sell it all and move to France. The competition has now CLOSED and thanks to my random number generator comment number 12 from George, posted on November 7 was the winner.